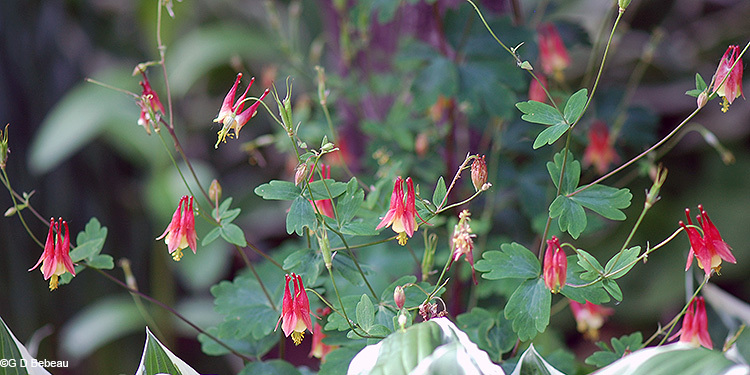 Columbines have showy nodding flowers with each petal having a long spur at the back forming a tube. Wild Columbine is a native erect perennial forb growing on slender green to reddish-green stems 1 to 3 feet high. There may be sparse branching near the top. Stems may or may not have fine hair. Leaves: The compound leaves are divided into 3-leaflet groups, each leaflet with clefts at the tip creating small lobes. Leaves will be on long stalks, enlarged where they meet the stem. Upper stem leaves can be much reduced however, with short or no stalks at all. 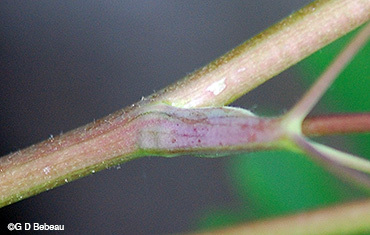 Leaf surfaces are without hair but may be slightly whitish or even a little sticky. Basal leaves only are produced the first year. Stem leaves of later years are alternate. The inflorescence has solitary flowers on long stalks at the top of the stem. The flowers are pendent, 1-1/4 to 1-1/2 inches long, with both the calyx and the corolla colored. There are 5 sepals, reddish in color with rounded tips, the tip area yellow. 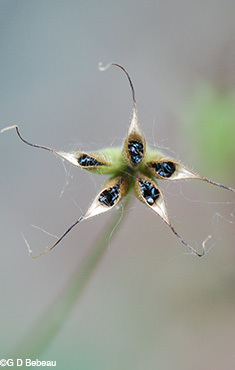 The sepal tips diverge outward and are alternate in placement with the 5 reddish petals that also have yellow tips with the yellow area much larger than that of the sepals. The petals have a long nectar spur, abruptly narrowed toward the base; these stand erect at the upward end of the flower. At the other end there are several styles, 20+ stamens of different lengths, with yellow anthers, all protruding from the corolla. The stamens close to the pistil are longer than the others. Seed: Fertile flowers mature to a brown pod of 5 follicles, which when mature, spread open at the tip to release small shiny black seeds. Each follicle has a long thin beak. Columbine self-seeds and from a single plant you can acquire quite a patch. Seeds can be easily gathered from the drying stem and sown where plants are desired - they require 60 days of cold stratification - just plant in the fall for germination in the Spring. 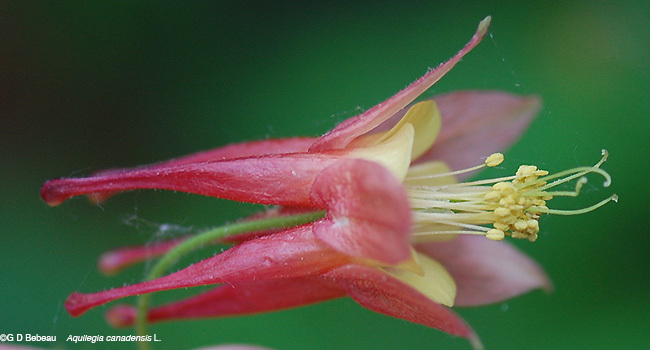 Wild Columbine is usually pollinated by hummingbirds and there are four known species of bees that can also pollinate the plant. 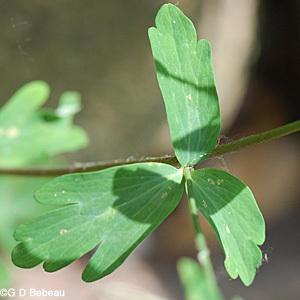 Habitat: Wild Columbine is a versatile plant, flowering in both sun and bright shade, doing best in loamy soil, mesic to dry moisture conditions. There is a vertical underground stem (a caudex) and in mid-summer the plant may die back to the caudex. A plant can live for 3 to 5 years. First year growth from seed is usually just a basal clump which can be easily transplanted. It survives in a wide range of habitats within USDA hardiness zones 3 to 8. Read Eloise Butler's notes below. Names: The genus Aquilegia is taken from the Latin word for eagle, aquila, whose claws are said to resemble the petals of the flower. 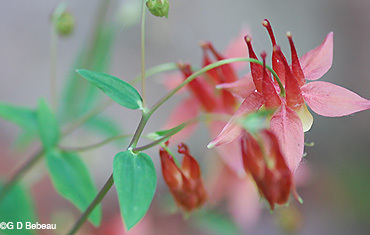 All species of this genus are Columbines. The species name, canadensis, means 'of Canada' where the species was first typed. The author name for the plant classification, 'L.' is for Carl Linnaeus (1707-1778), Swedish botanist and the developer of the binomial nomenclature of modern taxonomy. The Ranunculaceae family was formerly called the Crowfoot Family - now - Buttercup. Comparisons: While there are native North American Columbines in other colors, especially the enchanting Colorado blue, A. caerulea, there are also available from the nursery trade plants in various colors, many of which are often crosses with the European Columbine, A. vulgaris. One must check the parentage to be certain you have a native species. Above: Note the back reaching spur of each petal that forms a tube. Also, the protruding stamens and styles. Below: 1st photo - The lower leaves are larger and more deeply lobed. 2nd photo - The upper stem leaves are smaller without the deeply cleft lobes. Below: 1st photo - Leaf stems enlarge where they meet the stem forming a small sheath. 2nd photo - Note the very small upper leaves, without lobes and on the flower - the placement of the outward spreading reddish sepals alternate to the reddish nectar spurs of the petals. Below: Flower details. There are 20+ stamens of unequal length surrounding the pistil and several longer styles. The lower lips of the petals are yellow, transitional to reddish as they form the conical nectar spur. 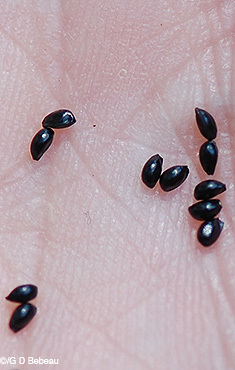 Below: Seeds. 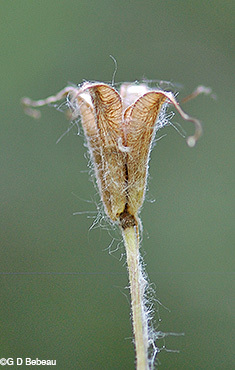 The five tubes of the flower mature to a brown pod of 5 follicles, which spread open at the top to release small black seeds. Each follicle has a long thin beak. White hair on the pod in these photos is not from Columbine from a near-by Cottonwood. 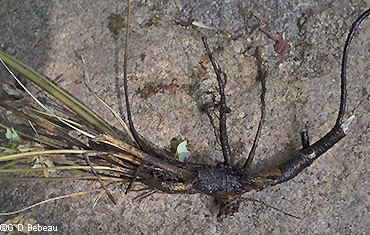 Below: The root of Columbine is a vertical underground woody stem (a caudex) with branching side roots and in mid-summer the plant will die back to the caudex. Notes: Wild Columbine is indigenous to the Garden area. Eloise Butler catalogued it on May 25, 1907. Martha Crone planted it in 1938 and over 50 plants in 1945, more in '46 and '47; Cary George planted it in 1993 and Susan Wilkins did also in 2009, 2011 and 2013. It is native to Minnesota in all but seven counties. Its range in the U.S. is the eastern 2/3rds of the country as far west as Kansas. 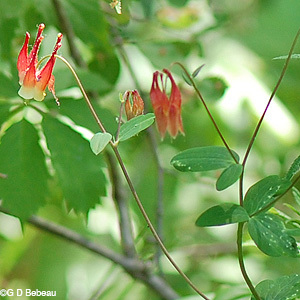 Aquilegia canadensis is the only native columbine found in Minnesota. In North America the plant ranges from the central plains eastward, absent in Louisiana and most of the Canadian maritime provinces. There are known folk medicinal uses for the seeds and for the roots. 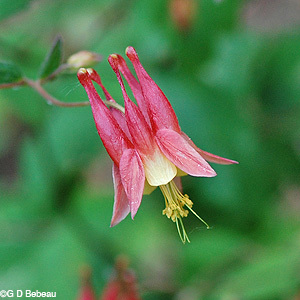 Eloise Butler wrote: "A much admired genus of the crowfoot family is the Columbine, which has one representative in Minnesota (Red Columbine, Aquilegia canadensis L.). All the columbines make a brave showing, from the cultivated ones of different hues to the peerless large white species, to the state flower of Colorado, (Rocky Mountain Columbine, Aquilegia caerulea James). But our species holds its own among them all, burgeoning in red and yellow in rich relief against the background of gray rock, as it nods from boulder crevices. The columbine has both calyx and corolla and both are colored. The long spurred petals gorged with nectar for the entertainment of insect guests have given rise to the name honeysuckle which, to avoid confusion, would better be kept for the true honeysuckle in no wise related to the columbine. 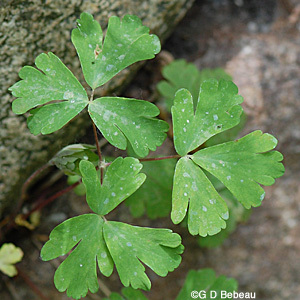 The foliage of the columbine is fern-like as is the meadow rue and others of the same family." Published May 28, 1911. Sunday Minneapolis Tribune.